The Trish's Angels operating philosophy is simple. All major foundation expenses are being underwritten by an anonymous donor. Your donation will assist an ALS patient in need. The board of directors and volunteers receive no salaries or other compensation. Please click the PayPal button above. 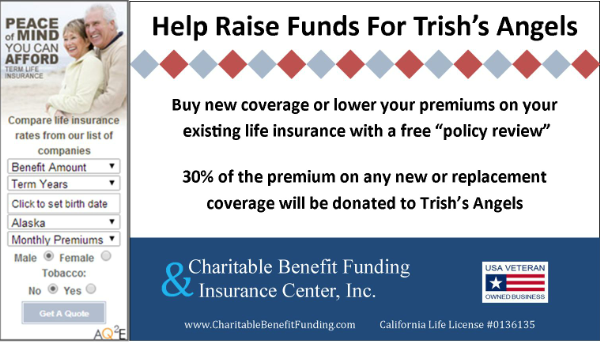 If you are interested in becoming a Trish's Angels Corporate Sponsor, you can contact Harry Hoyt at hhoyt@trishsangelsals.org with any inquiries. To submit a corporate donation online, select the Paypal button above & in the 'notes' section please mention your donation is for a Corporate Sponsorship. Click here for details and sponsorship levels available. Remember someone special by giving a gift in their memory. Trish's Angels organization will send a notification to the person of your choice with a personalized message from you. When making a donation 'In Memory' of someone special, please email info@trishsangelsals.org and provide us their home address, email and your short message. Give a gift to honor someone close to you for a birthday, an anniversary, a wedding, to celebrate the birth of a baby or other special occasions. We will send a notification acknowledging your thoughtful donation to the person of your choice. When making a donation 'In Honor' of someone special, please email info@trishsangelsals.org and provide us their home address, email and your short message. Many corporations and businesses will match an employee's donation to a charitable cause. Please contact your human resources department to find out if your company will match your donation. Download the Communities for a Cause App and shop merchants who donate a portion of your purchase to Trish's Angels. It's an easy way to help support ALS patients in need! Featured Business: Shop Target Online through the CFC App, and they'll donate 5% of your purchase to Trish's Angels! If you are a business, join the network of merchants to help support your local community charities. Click here to sign up!